Genetic Predisposition, which is affected primarily by male hormones. Genetic male hair loss is hereditary, i e the genetic programming of a hair follicle causes it to be hypersensitive to male hormones. When hair falls out (from Telogen to Anagen Phase), an chemical enzyme (DHT – Dihydrotestostorone) gets too close to the follicle and temporarily paralyses it, which action allows fatty deposits and cellular debris (waste products) in, which prevents the follicle from growing normally. The DHT is slowly strangling your hair follicles at the root, depriving them of the oxygen and nutrients that healthy hair requires. 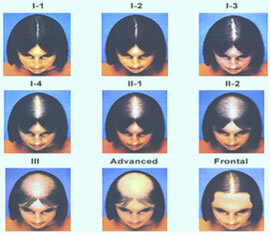 Every time your hair grows back after a resting phase, it is thinner, less vigorous. And eventually, follicle-by-follicle, it stops growing back altogether . As the hair life cycle repeats itself, the hair gradually shrivels up and eventually dies. 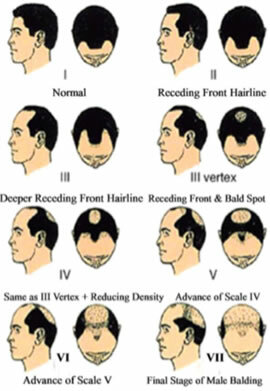 Ultimately, the receding hairline begins to fall into the Scale of male pattern baldness. Aging is another factor that combines with genetics to trigger certain hormones, mainly DHT (Dihydrotestosterone) to overproduce. An overabundance of DHT causes hair to miniaturize, or getting thinner, weaker and grayer. External Influences like stress, diet, lack of sleep, even smoking marijuana can have negative effects on your hair. A 2008 study done in Amsterdam, where marijuana is legal, concluded that its use “frighteningly” accelerated hair loss in men ages 18-45. Some illnesses such as diabetes, lupus and heart disease can accelerate the natural process of losing one’s hair as well. While women’s hair loss rarely resembles the patterns of hair loss so often seen in men, it usually comes with diffused thinning of the hair all over the head. Alopecia Areata is the most common form of an unusual auto-immune skin disease resulting in patchy hair loss on your scalp. Our healthy human body uses an effective set of weapons — the immune system — against viruses, bacteria, and parasites that can attack your body. Unfortunately, this powerful auto immune system sometimes mistakenly attacks the body itself It usually starts with a small patch of hair loss and continues with one or more small, round patches of hair loss on your head. Androgenetic Alopecia is a common form of genetic hair loss in both men and women. Androgenetic Alopecia in women rarely leads to total baldness except thinning over the head and the hairline does not recede. Scientists have still not reached a consensus about the genetic and hormonal mechanisms that trigger hair loss, but DHT (Dihydrotestosterone) an androgen (male) hormone, is one of the main culprits in hair loss. In women, hormone imbalance often comes with age. Menopause might be the trigger for this extra dose of male hormone that causes hair to thin on the scalp and grow coarser on the face because the body begins to produce less estrogen. Women experiencing hair loss should check with their doctor to make sure there are no medical reasons for their hair loss. Eliminate illness such as diabetes, thyroid conditions, stress induced alopecia, or prescription medication as the cause. Pregnancies, Anemia, certain medications, some weight loss diets, hormonal deficiencies such as Hyper-thyrodism, Stress and so on. Also improper application of home dye/bleach and prolong usage of heated straighter on hair are the usual external causes for hair loss. Technology has caught up with the hair replacement industry, Hair Confidence Hair Loss Consultancy can custom-design a hair replacement system for you that breathes like your own skin and is capable of giving you a natural and healthier appearance. These devices can replace all of your hair and allow you to sleep, shower and perform your normal daily activities, which can go a long way toward helping you to feel a lot better. Our systems allow you to grow back your own hair. So it’s a particularly suitable and effective solution after chemotherapy, accidental hair loss or trichotillomania (hair pulling). Patients who suffer from trichotillomania has strong compulsion to pull hair out from the head or body resulting in noticeable bald patches. It goes far beyond just a ‘habit.’ Many patients with this condition won’t even come in for help because they don’t want anyone to know. For trichotillomania sufferers, it acts as a barrier making it particularly difficult to pull out natural hair. In that way, it can help break the habit. We have seen cases where, after about 8-10 months, clients have managed to grow all their hair back to a reasonable length and stop using any hair replacement solution. And they never believed that this would be possible.